The irony of content marketing is that the key element, web content creation, is the greatest obstacle to success. Aside from the “stage fright” many folks feel when thinking about others reading their posts, listening to their podcasts or watching their videos, it’s easy to get overwhelmed when choosing the tools to use for creating web content. It’s easy to get overwhelmed when choosing the tools to use for creating web content. That’s right, there are a lot of options for creating all types of content and sifting through them all to find the best is a daunting task. To combat this obstacle and make effective content marketing more accessible to all, I’ve decided to create the “Web Content Creation Tools – Top Picks” award. Each year, I will award specific web content creation solutions the “Top Pick” title. These solutions will be selected based on features, functionality and ease-of-use. The winners earn bragging rights and the right to display the “Web Content Creation Tools – Top Picks” badge on their site. I use each and every one of the winning solutions to create content for my own sites. And, if you’re looking for the best tools for creating web content, you can feel secure that the winners were selected after I tried many solutions and selected to use each one to create content for my own sites. So, without further ado, here are the first annual “Web Content Creation Tools – Top Picks”! When it comes to creating a website, with or without a blog, WordPress is quickly becoming a standard. With an seemingly infinite amount of site templates from which to choose, a large pool of plugins for adding any functionality under the sun and a huge amount of online how-to content, WordPress is a powerful platform on which to build your site. Best of all, you can start small with WordPress.com and then add more features and functionality (if necessary) using WordPress.org. To learn more about this approach, check out my “Online Solutions for Building a Blog” video. The best format for downloadable documents such as white papers, presentations, ebooks and more is the PDF and no one knows more about creating PDFs than Adobe because they invented them. Installing Adobe Acrobat on your computer allows you to create as many ready-to-upload PDFs as you’d like. Even better, Acrobat comes with plugins for all your favorite desktop content creation software such as Word and PowerPoint. And, once a PDF document is created, you can use Acrobat to do all sorts of things to it including editing and adding password protection. Sure, there are many cheaper or even free solutions online for creating PDFs, but if you want to create high-quality content that both reads and looks good, Acrobat is the best way to go. If you do not want to plop down the cash for Acrobat, then check out their new online version, Adobe CreatePDF, for a less expensive yet still robust option. Video is definitely the content type with the seemingly highest technical bar to get over, but with just a camcorder, my computer and Camtasia, I’ve been able to create professional videos that draw traffic to my site. I selected Camtasia because it has the most features for the best price and a remarkably easy learning curve. When I do have “how-to” questions, the instructional videos at their site walk me through step-by-step. Camtasia is available for both the PC and the Mac – I’ve used both. When I switched to a Mac a couple of years ago, that version lagged in features, but the past two years have seen regular releases and I’m quite pleased with the Mac version today. Screenflow – Screenflow is a video creation tool for the Mac. Before Camtasia’s Mac version was up-to-snuff, this was the go-to solution, but these days, they are very similar to each other. Online Video Creation Tools – the past few years have seen a rise in online solutions for creating videos. One great feature of these tools is that they provide templates, images and even music for you to use in your videos. Some of the best I’ve seen include: PowToon, Animoto, GoAnimate and Prezi. If you want to content that really goes the distance, nothing beats a webinar and when it comes to webinar solutions, nothing beats GoToWebinar. Webinars give you an excuse to contact your customers before, during and after the actual event. That’s a lot of touch points for one piece of content. Even better, you can record your webinars and post them to your site so that future customers can be drawn by the content as well. GoToWebinar handles it all for you. From sign-up pages to great “during the webinar” functionality to after-the-webinar e-mails and reports, you’ll find it all here. Another plus: they have great support – any issues that have arisen were handled quickly. MeetingBurner – I’ve been on the audience end of many MeetingBurner webinars and the system has worked smoothly throughout. Love ’em or hate ’em, you’ll find infographics everywhere online. I happen to love ’em for presenting information and I use them in my posts as often as I can. Up until now, creating infographics required some decent design skills and experience with Photoshop, Illustrator or some other graphic design software. However, a new breed of solutions has arisen to make creating infographics accessible to all content creators and Piktochart is the best one out there. With tons of templates, an easy-to-use design interface and decent pricing, you can let your information shine with Piktochart. Social media updates are a great way to extend the usefulness of your content marketing efforts. There are a lot of solutions for scheduling and tracking those updates, but my favorite is HootSuite. With HootSuite, you can update Twitter, Facebook, Google+, LinkedIn and other social media networks all in one place. HootSuite is a purely online solution which means wherever I go, I can access my dashboard and all the functionality I need using a computer, ipad or smart phone. Conducting market research by setting up searches for specific topics and questions. Opt-in e-mail marketing lists are a great way to deliver content to, and stay in touch with, customers and potential customers who want to hear from you. There a lot of e-mail marketing solutions out there, but AWeber is the choice of most e-mail marketing pros. That’s because the solution offers flexible and easy-to-implement integration and automation features that support pretty much any scenario you can imagine; all while helping you streamline your processes and save time. While their e-mail templates are solid, they will not knock you off your feet. However, you can customize and create your own templates. As if making up for their less-flashy template designs, AWeber’s huge selection of customizable sign-up form designs will really drive folks to join your list. Lastly, AWeber’s user support is great – they answer quickly and talk “non-techie” speak. MailChimp – a good alternative to Aweber, these guys really go all out when designing templates. Plus, if you like chimps, this is the place to be – their mascot smiles out at you from every page once you log in. Using Udemy, you can combine almost any of the content types mentioned above into an online course that that you can either offer to your customers for free or sell as an additional revenue stream. Udemy’s course interface is easy-to-use. You simply need to upload your content, create a course description, add a preview video and you’re ready to go. You can send announcements to your students and even hold live sessions with them via the site. If you plan to charge for your course, all you need is a PayPal account. Udemy is very gung-ho about their product and they offer ideas, coupons and a lively forum over at Facebook where you can talk with and ask questions of staff members and other instructors. You can see a sample of a Udemy course listing by viewing my “Quickly and Easily Create Content For the Web!” course. If you’re interested in content marketing resources and ideas for your business, then sign-up (it’s free) to receive updates as I add more resources including real life examples of using content marketing. These are definitely great tools to have. I use mailchimp because it’s simple. There a few tools that I wasn’t aware of. Thanks for sharing. You bet Janet – glad you found the post useful! I do like MailChimp, especially their templates, but for automation you just can’t beat AWeber. Great tools, Matt. Thanks for compiling the list. Regarding E-Mail Marketing, do you know anything about Constant Contact and whether they are any good? You’re welcome Ian – glad you found the post useful! The big advantage to Constant Contact is that they have a number of add-on solutions such as events, surveys, etc. The disadvantage is that their e-mail solution is less powerful, and not as easy-to-use, as stand-alone solutions such as AWeber and MailChimp. Looking for the best tools for creating web content? 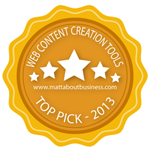 Then check out the winners of the “Web Content Creation Tools – Top Picks for 2013” award….